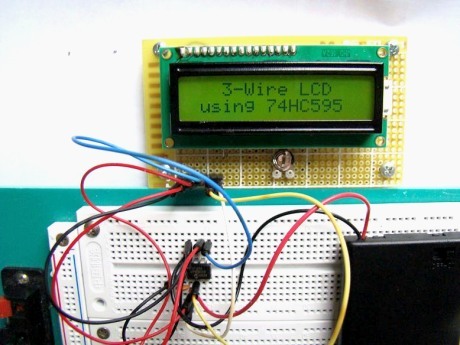 Why pay for Serial LCDs when you can make your own? HD44780 based LCD displays are very popular for embedded projects because they are cheap, easy to interface, can display characters, consume power lot less than seven-segment displays, and most of the present day compilers have in-built library routines for them. However, the only disadvantage is that they require at least 6 I/O pins of microcontroller. Well, you may ask, isn’t that less than what seven-segment displays require? Yes, that’s true but there are circumstances where you don’t have left enough pins for LCD display. For example, if you are going to design a temperature sensor based on a PIC12F683 microcontroller, which has just 6 I/O pins, you won’t have pins for interfacing a LCD. One solution for cases like that is to use serial LCD’s. Serial LCD’s available in the market cost more than double of HD44780 based standard one. The serial LCD’s still have the standard LCD module but it has an extra built-in driver module that receives data/command from a host microcontroller in serial format and convert it to appropriate parallel format suitable for HD44780 driver input. The goal of this project is to show how to make a 3-wire serial LCD driver for low pin-count microcontrollers like PIC12F series using a serial-in parallel-out shift register (74HC595 in this case). PIC12F683 has been chosen here to test the end product. Since 74HC595 is just a shift register with no intelligence of its own, the burden goes to the host microcontroller (PIC12F683) to appropriately transfer the LCD character/command data and control signals in serial format. This part of the intelligence is embedded in the firmware inside PIC12F683. So, a portion of program flash memory inside PIC12F683 is sacrificed for this purpose. The required three pins of PIC12F683 performs following functions. 74HC595 is a high-speed 8-bit serial in, serial/parallel-out shift register. It also has a storage register and 3-state outputs. The two registers (shift and stoarge) have separate clocks, SH_CP and ST_CP respectively. Data in the shift register is shifted on the positive-going transitions of SH_CP, and the content of shift register will be transferred to the storage register on a positive-going transition of the ST_CP. If both the clocks are together, the shift register will be one clock ahead of the storage register. The output enable (OE) pin, when pulled Low, enables the 8-bit data of the storage register to show up at the parallel output (Q0-Q7). SH_CP and ST_CP clocks are tied together for this purpose and are driven together by a microcontroller pin. So, the storage register output (Q0-Q7) is 1 clock behind the shift register, and an additional clock pulse is required after the last bit is fed to the serial input so that it would appear at the output. 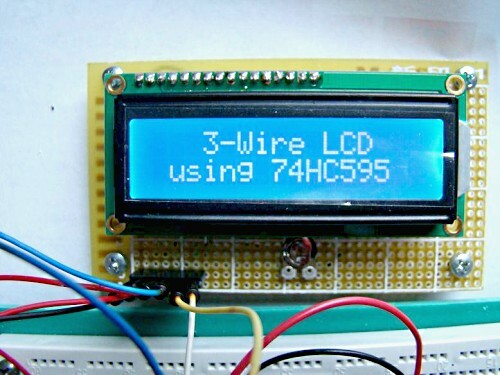 HD44780 based character LCD displays use 14 wire connections: 8 data lines (D0-D7), 3 control lines (RS, E, R/W), and three power lines (Vdd, Vss, Vee). Some LCDs come with backlight features that help reading display data in low illumination conditions. They have two additional connections (LED+ and LED-). The control pin R/W determines if the data transfer between the LCD module and an external microcontroller are actual character data or command/status. 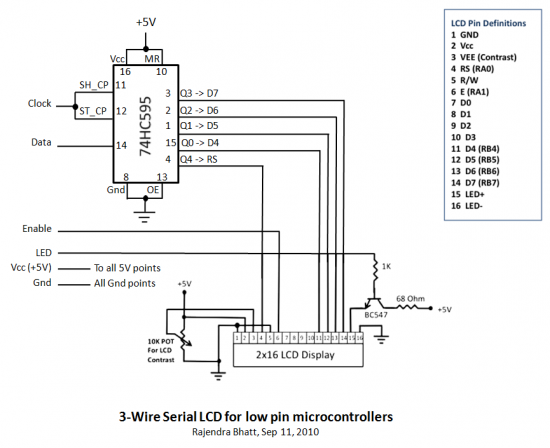 When the microcontroller needs to send commands to LCD or to read LCD status, it must be pulled low. Similarly, this must be pulled high if character data is to be sent to and from the LCD module. The direction of data transfer is controlled by the R/W pin. 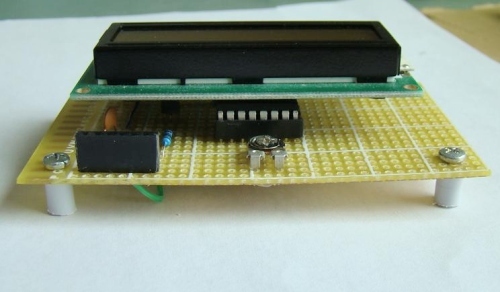 If it is pulled Low, the commands or character data is written to the LCD module. And, when it is pulled high, the character data or status information from the LCD registers is read. In this project, we will use one way data transfer, i.e., from microcontroller to LCD module, so the R/W pin will be grounded permanently. LCD module data sheets recommend to use +5V d.c. supply for operation, but some LCDs may work well for a wider range of volatge (3.0 to 5.5 V). The Vdd pin (2) should be connected to the positive power supply and Vss (1) to ground. Pin 3 (Vee) is for display contrast adjusment, which is usually connected to a voltage between 0 and 2V by using a preset potentiometer. Pins 7 to 14 are data lines (D0-D7). Data transfer to and from the display can be achieved either in 8-bit or 4-bit mode. The 8-bit mode uses all eight data lines to transfer a byte, whereas, in 4-bit mode, a byte is transferred as two 4-bit nibbles. In the later case, only the upper 4 data lines (D4-D7) are used. This technique is beneficial as this saves some input/output pins of microcontroller. The circuit diagram of this project is fairly simple. As mentioned earlier, the challenging part of this project is the driver software required for PIC12F683. The LCD data transfer uses 4-bit mode. Therefore, any 8-bit command or character data is sent in two steps: send the higher nibble first, and then the lower nibble. The R/W control pin is grounded because there is no data or status read from the LCD module in this project. The 4-bit nibble data and Register Select (RS) control signal are serially transferred to 74HC595. They appear at Q0-Q4 on 6th clock pulse. Note, Q0-Q3 are connected to D4-D7 and Q4 to RS. When they are ready at LCD data lines (D4-D7) and RS control pin, Enable pulse is generated by PIC12F683. 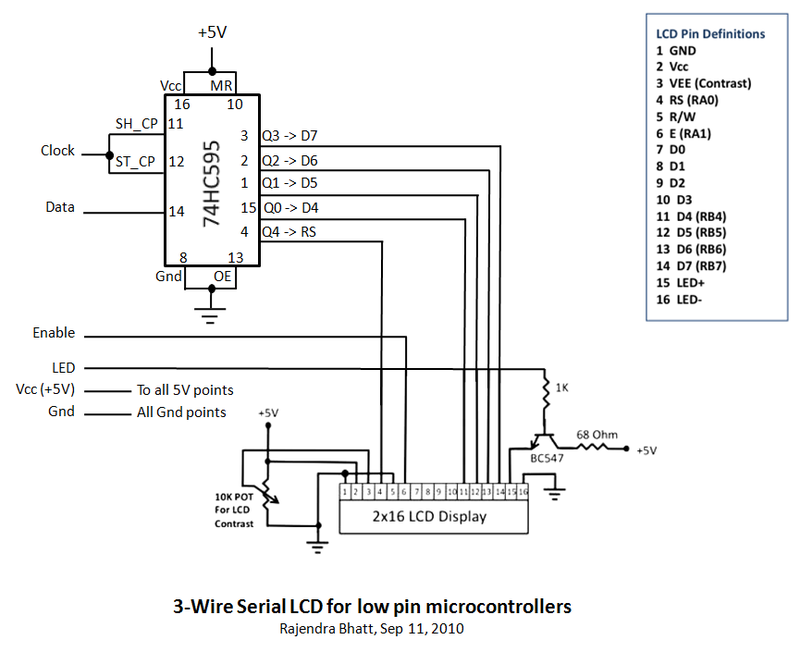 This arrangement, therefore, requires 3-pins of microcontroller to display character data on a parallel LCD display: 2 pins for providing Clock and Data to 74HC595, and 1 pin for enable control (E) pin of LCD module. The SH_CP (11) and ST_CP (12) clock inputs of 75HC595 are tied together. 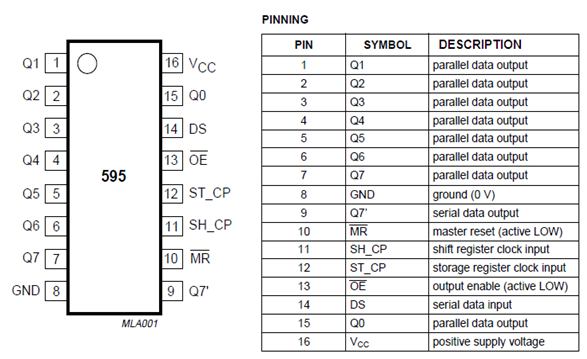 Serial data from microcontroller is received by the shift register through DS (14) pin. OE (13) pin is always grounded and reset pin MR (10) is pulled high. Parallel outputs Q0-Q3 from 74HC595 are connected to D4-D7 pins of the LCD module. Similarly, Q4 output serves for RS control pin. If the LCD module comes with a built-in backlight LED, it can simply be turned ON or OFF through LED control pin shown above. Pulling the LED pin to logic high will turn the back light ON. 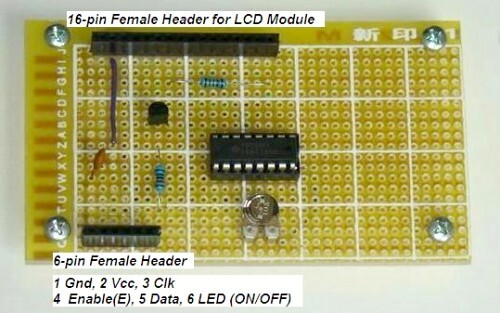 This circuit can be soldered on a general purpose prototyping board as shown below. The driver routines demonstrated here for the 3-wire LCD are written in mikroC. But the same logic could be implemented in any other high-level or assembly languages too. The LCD module gets initialized in 8-bit mode by default when it is first turned on. A sequence of commands is required to initialize it into 4-bit mode. All the routines described here work for 16×2 LCD, however, they could be modified for other LCD modules, like 8×2, 16×1, etc. Initialize_LCD() : Initializes the 16×2 character LCD module to operate into 4-bit mode, 2 lines display, 5×7 size character, display ON, with cursor OFF. Write_LCD_Data() : Sends a character byte to display at current cursor position. Write_LCD_Cmd() : Writes a command byte to the LCD module. Write_LCD_Nibble() : Used by Write_LCD_Data() and Write_LCD_Cmd() functions to send LCD data and command as two nibbles. Write_LCD_Text() : Writes a character string at the current cursor position. Uses Write_LCD_Data() within a for loop. Position_LCD() : Changes the current cursor position. While using these routines, at the beginning of your program, the Data_Pin, Clk_Pin, and Enable_Pin variables must be defined to the proper microcontroller ports used in the circuit. The test circuit given here uses GP1 of PIC12F683 as Clk_Pin, GP5 as Data_Pin, and GP2 as Enable_Pin. Two blinking character strings, Message1 and Message2, are displayed at different locations on LCD using these routines. Running at 4 MHz internal clock, MCLR disabled, WDT OFF. Clock, Data, and Enable lines are served through GP1, GP5, and GP2 ports. Interesting educative project, but I have a different idea, is this project idea can work in opposite way? 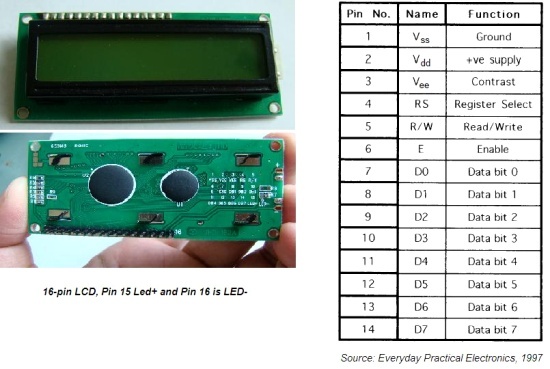 for example, i’m looking for a way how to take parallel data from a PIC going to 1×16 LCD and turn it to serial data so that I can use it for a 7 segment LED board that has serial input ? is it possible ? I, too am trying to achieve this. Have you made any progress in your endeavors? 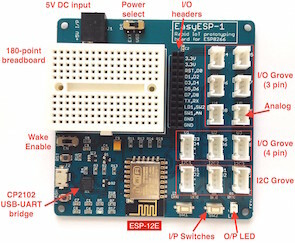 do you know of any way of running this using an arduino? If you eliminate the LED control you can do this with 2 wires. I made a 3-wire, shift register interface that has simpler code because it does a full 8-bit interface to the 1602 LCD. It uses the 74HC164 shift register which does not require an extra clock to latch after doing the shift like the HC595 does. It does not include LED control but that isn’t important for my applications. 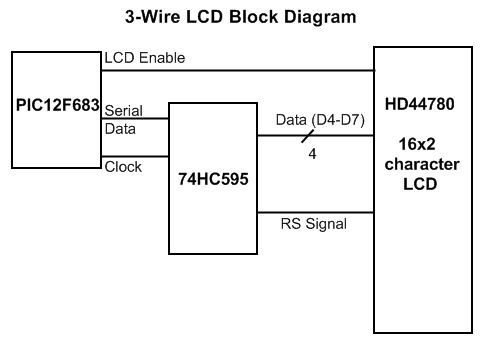 Simple assembly code for the 12F683 that allows the clock line to also control the register select of the LCD. I agree, great project indeed. Just it didn’t work on my AVR(Easy AVR). I have used WH1602b 16×2 cheap display from WinStar, re-wrote source to adopt port pins for tiny44, but, LCD was displaying garbage data.. I assumed it is timing issue, and found that it is critical to let some time Enable bit left HIGH (50µs worked for me) at the end of “Write_LCD_Nibble” before switch to low. This, like all the projects here are just great! Very well documented. Do you hex code of the same pls? I am AVR guy hence not aware fully with PIC programming and not having any IDE so. ..maybe you should update it in your code. How to modify code to work on 20×2 LCD display? You are right. Something went wrong while copying and pasting the code. I have corrected it now. It should work for 20×2 LCD too without any changes. Did you try? Pingback: ???????? ??????????? Urd | RepRap-?????? I typo-ed the schematic link tags. Thank you for sharing the diagram. I understand what you are saying, we can save one more pin by this method, and we should make sure that the output of shift register connected to the cathode of diode is always high while generating the E pulse. We can do that by shifting an extra 1 at the beginning of any 4 bit LCD data or command. You can save one wire of the microcontroller interface by using an output on the shift-register wire-or’ed with the clock to drive the LCD Enable pin. I found this idea years ago, so unfortunately I can’t remember where. Very well documented – I love it!